The Indiana Department of Homeland Security encourages Hoosiers to plan ahead for extreme weather as part of Severe Weather Preparedness Week, March 17-23. HSJ Online had a tremendous fourth year, and we would like to invite you to a celebration, including a yearly business review as well as special presentations, at the Yellow Trail Museum on Friday, March 29th. Bartholomew County Sheriff's Department and Columbus Police Department are planning patrols in March, focused on aggressive driving. Sgt. Clayton White, of Hope, was recently promoted to sergeant. 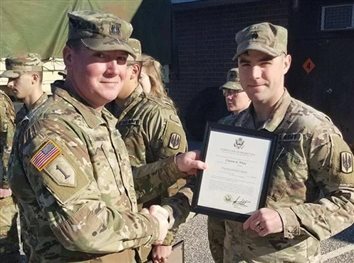 He is stationed at Fort Bragg, N.C. in Able Battery. His mother Alise Pate, is formerly from Hope. A Hope-area business has been honored by an online wedding planning service. Hope United Methodist Church is hosting a Blue Christmas Service Friday for those suffering from grief this Christmas season. The voting is live for the best holiday decorations in the town of Hope as part of the Main Street of Hope Deck the Town contest. Ivy Tech Community College in Columbus is inviting high school students and their parents to a special event Nov. 15th to learn about the College and how to navigate the necessary steps for enrolling. As the election approaches, the Indiana Department of Transportation reminds Hoosiers that campaign signs are prohibited from state right-of-way. Early voting runs weekday from 8 to 5 p.m. through Friday, Nov. 2nd, with a half day of voting until noon on Monday, Nov. 5th at the voter registration office in the Bartholomew County Courthouse. The voter registration office will add Saturday hours on Oct. 27th and Nov 3rd, from 8 to 3 p.m.
Karen Shank-Chapman from the Wayne County Historical Museum in Richmond will be making a presentation on Spiritualism in the Victorian era on Friday at the Yellow Trail Museum. The Bartholomew County Sheriff’s Office and the Columbus Police Department are joining about 230 law-enforcement agencies across Indiana and thousands nationwide in the Drive Sober or Get Pulled Over mobilization. From mid-August through Labor Day, police will be out in full force arresting impaired drivers. 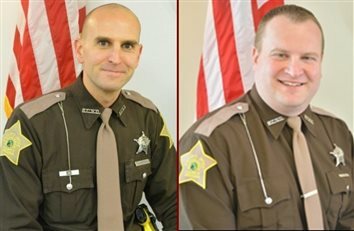 Bartholomew County Sheriff Matt Myers has appointed two additional deputies to serve in the DARE program, Nick Martoccia and Andrew Whipker. Lily Cross, a 2015 graduate of Hauser High School, earned a place on the 2018 spring semester President's list with a 4.0 GPA at the University of South Alabama. The Bartholomew County 4-H Council will be holding its 13th annual Drive-Thru Lunch from 11 a.m. to 1 p.m. on Thursday, June 21st at the St. Peter's Lutheran School front parking lot. The Bartholomew County Sheriff’s Office is warning that the names of department personnel are being used in a telephone scam. Bartholomew County Sheriff Matthew A. Myers recently swore in two new merit deputies, Dylan Prather and Frank Munoz-Jaime. Bartholomew County Sheriff’s detectives are looking for a man reported missing on Sunday, May 13, 2018.